Our much-anticipated Vacation Guide is here and along with fascinating Canadian places, we also take a trip south to Montana to explore some shared history, and a surprising trip to Australia! We’ve got a series of interviews with different ranchers on what works on their outfit for a smooth branding and we lay bare the sad facts of a century-old murder and cover up — and one of the earlier examples of “fake news.” A new-to-us invasive species is crossing north into Canada and we’re now at war with feral pigs. 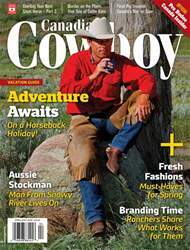 All of this, plus the continuing horse training series by JP Forget and a look at spring fashion, in the Apr/May issue of Canadian Cowboy Country!